So, when was the first restaurant created? Could it have been when Adam and Eve went to the all-you-can-eat buffet at the "Garden?" But as Adam and Eve found out, when it comes to buffet night, there is always something that we undoubtedly want that's not on the menu. Perhaps, we could point to another ancestor who turned his dwelling into an haute-cuisine restaurant for travelers. Yes, Abraham made certain that his tent was conveniently open to all, so guests could arrive and enter on all four sides. Imagine the convenience of four entrances at any of the eateries on Coney Island Avenue in Brooklyn? Our forefather, Abraham, in fact, had a lot in common with present-day restaurateurs. We are told that he was extremely eager to please his guests and went as far as running out to welcome them. We are further assured that he prepared from the freshest and the best cuts of meat. After all, Sara's culinary expertise had to satisfy a higher, "heavenly" authority. 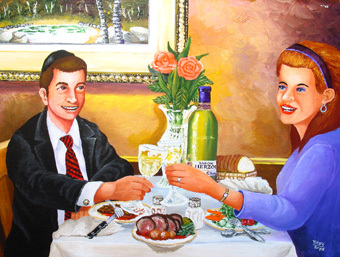 It is true that the concept of eating and sharing your feasts with others has played a major role in our Jewish history. Jacob couldn't have gotten the rights of first-born without giving Esau Lentil Soup- which, I might add, is still an excellent choice yet surprisingly hard to find in today's restaurants. In addition, it was in the aftermath of a private party of 12 for Joseph and his brothers that Joseph broke the news about his true identity. The importance of acting as a host as well as gathering to enjoy a feast with family and friends was recognized as early as 5000 years ago. Today, it is no different. In fact, the restaurant has been there our entire lives- playing a role you might never have thought of. From the time we were kids using the restaurant’s high chairs and ordering from the kids menu to our teenage years, it became the place to go to when we wanted to get out of the house. We were able to hang out there and talk with our friends. It was where we felt grown up, cool and on our own. Then it was the dating era, where restaurants became the perfect setting for a date, where you could form bonds and friendships. It was also the place to celebrate our birthdays, graduations, when Mom didn't want to cook, when Dad got a raise or when you got your first job. For some of us, they were the spot where we proposed, had our bachelor parties and Sheva Brachot. Soon enough, it was where we took our kids, as our parents did in the past. And before you knew it, you were celebrating your 10th, 25th, and for the lucky ones, 50th and 60th anniversaries. As nice as it is to dine at home, there is something about getting dressed up and satisfying our appetite for a dish we couldn't prepare ourselves. When restaurant owners say that their establishments are "our home away from home," they're right. The truth is people like to "go out" and talk about what’s new and hip in the restaurant world. There is something about how they make us feel. Whether you frequent one, a few, or all, restaurants are the epicenter of happy occasions. I encourage you to go out and create a memory.